The suggestion to implant a VNS was made by our neurologist years ago. But there were still options to try so we held off. Unfortunately, CBD was not our miracle and other medications didn’t help. The seizures kept coming and we ran out of things to try. When our neurologist brought up the VNS again, I felt the overwhelming weight of the decision squeezing the air out of me. If it even has the potential to improve his quality of life, she asked, shouldn’t we try it? Of course, she was right, but that knowledge didn’t help me breathe. Neither did having an amazing surgeon in one of the best children’s hospitals in the country. Neither did the love and support of friends who would try to reassure me about how safe surgery and anesthesia are. Neither did my wife who held everything together when I couldn’t. It wasn’t the mechanics of the surgery that occupied my thoughts. It was the idea of cutting into my little boy. It was the permanence of it all. It was the thing that can’t be undone. We can wean off a medication that doesn’t work. We can stop the ketogenic diet. 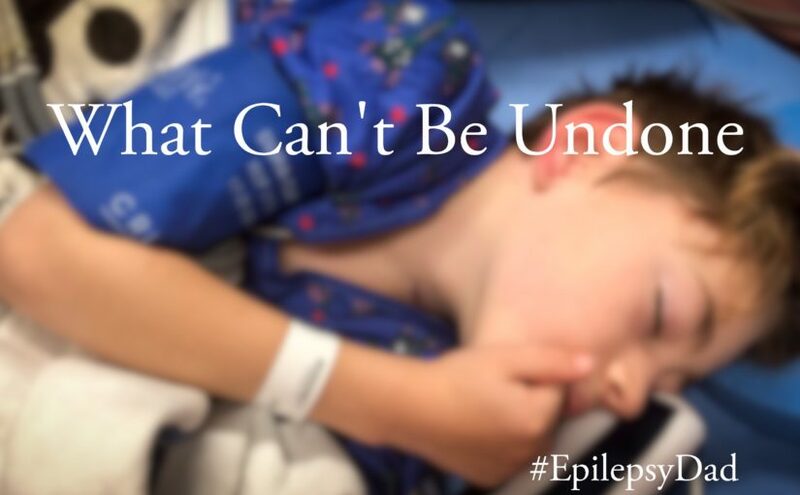 If years from now his seizures miraculously go away, we could stop everything and pretend that all the hard things about his childhood didn’t happen. There would be no signs, no trace. I could live in denial about how traumatized I was by this experience. But the surgery forced me to confront the fact that these things aren’t going away. That the magical, unburdened life I wanted for my son is not going to materialize. That I can’t fix this or make it go away. That this is real, and that the future for him will include challenges brought on by his condition. That I’ve somehow failed him. From the time the decision was made to the time they wheeled him away hopped up on “giggle juice”, I pushed my feelings down. I was practical but emotionless. I showed up for the appointments and answered the questions as he was prepped for surgery, but I wasn’t really there. I couldn’t be. I had to push it all down just to appear strong enough to make it through. Even after his surgery was over, I had a hard time being present and acknowledging what had happened. I had a hard time looking at his scars. They were bigger than I thought they would be. Instead of small ones hidden by clothes, they’re long and visible. I looked away. I caught a glimpse of the device itself, raised under the skin and I looked away. It’s more than just being squeamish, it’s a spotlight of reality shining into my eyes and blinding me. I worry that he’ll think I can’t look at him. I worry that he’ll feel like he did something wrong or that there is something wrong with him that is causing this reaction from me. I’m worried that I can’t get over my own hang-ups and be there for him when he needs me. I tried to explain to him the feelings I was having but he didn’t understand. I didn’t, either, until I started to unpack them. But I still don’t know what to do with them. I want my acceptance to turn the spotlight that was blinding me into a beacon that brings me to him. But instead, it feels like the light has turned off. It’s not repelling me but it’s also not drawing me in. Instead, I’m left in the darkness trying to find my way. But I can hear his voice. And I hear my wife’s voice. They’re calling me. And so I’m pushing through the blackness, the emptiness, to find my way back to them. It’s scary and impossibly hard. But I can hear them and they need me. I can hear them, and I don’t feel alone.